Without question, time (or lack thereof) is the most common excuse for not working out. Can you relate? How many times have you skipped the gym because you thought you didn’t have enough time? I see this time and time again with my clients. When life gets busy, the first thing to fall by the wayside is exercise. 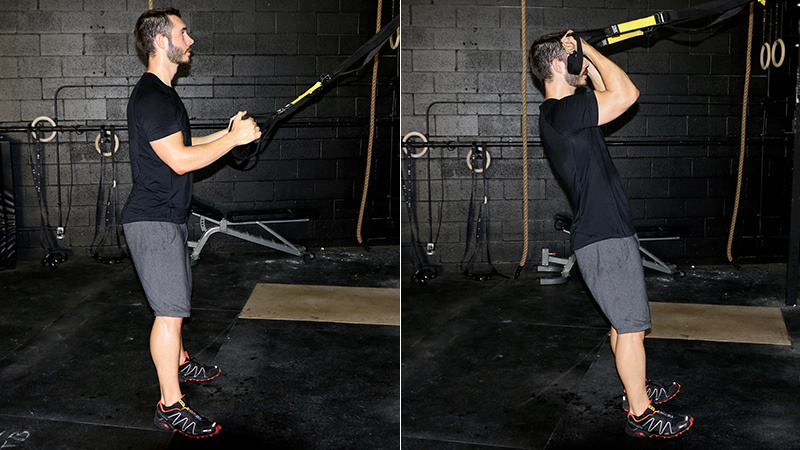 If you follow this TRX workout routine to the letter, you will find you get better results using a shorter, more intense, and more efficient workout. A simple 30 to 40 minute workout, when done right, is all you need for optimal gains in lean muscle development and improving your overall fitness level. 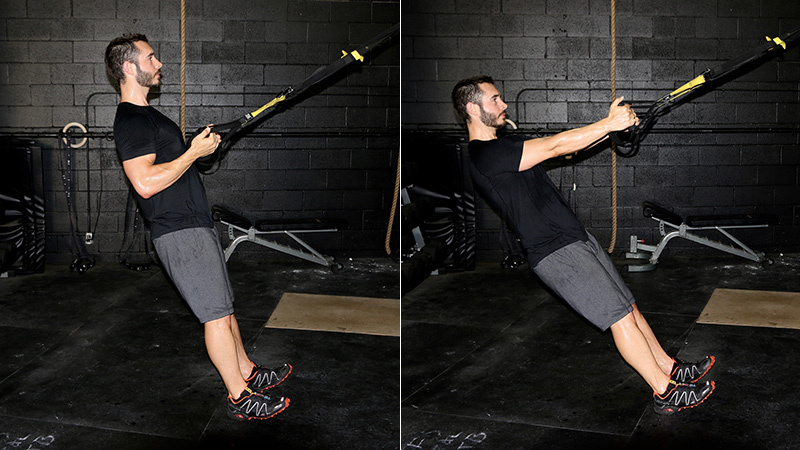 Additionally, TRX is great for all skill levels, as there is the ability to change the level of difficultly simply by standing closer to or further away from the anchor point. Face away from the anchor point. Start with your arms out in front of you to keep tension on the suspension trainer, and a straight line from the top of your head to your feet – chest up, glutes contracted, legs straight and abs braced. From there, slowly (three to four seconds) lower yourself into a pushup. For most people, the end point is with your upper arms at 90 degrees to your forearms. The goal isn’t a massive “stretch” on your chest at the bottom of the movement – this will only put undue stress on your shoulder joint over time. As you push yourself back up to the starting position, do so with a controlled count of one to two seconds. To keep tension on the working muscles, push your arms straight out, and stop short of standing up straight. Face the anchor point. With extending your arms, palms facing each other, keep a straight line from the top of your head to your heels. The tendency is to “sag” at your hips. Don’t let that happen. Keep your glutes contracted and core braced. While keeping your shoulder blades down (depressed), pull yourself up by contracting your back muscles with that same 1 to 2 second concentric contraction (latissimus dorsi focus). The goal here is to maximally shorten your back muscles, not necessarily to touch your hands to your rib cage. On the way back to the starting position (3 to 4 seconds), don’t let the tension off your lat muscles. The idea isn’t to let them “relax” at any point during the set. 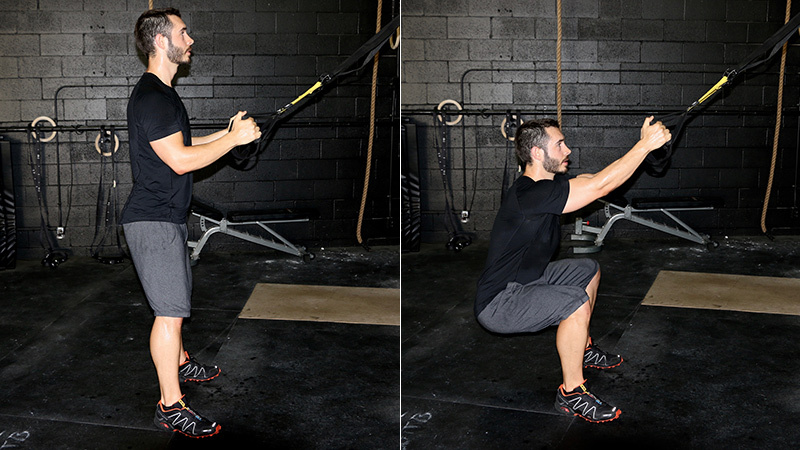 The goal of the squat is not just to “sit down” and then “stand up”. The goal is to use your muscles to move your body. Start by standing up tall, chest up, and abs braced. Slowly lower yourself (3 to 4 seconds) pulling yourself down to the ground with your hamstrings. At the bottom, pause for 1 second and actively engage your quads by thinking about shoving into the ground, and slightly on the outside of your feet. Push so hard that your body has no choice but to move. *Advanced trainees can progress to a “jump squat.” All the same principles apply, with an explosive jump and soft landing. Start standing “proud”, chest up, abs braced. Step back with one leg until both knees are at 90 degrees, and the back knee almost touches or lightly touches the ground. Similar to the squat, think about pushing into the ground as hard as you can with the FRONT foot until your body has no choice to move until you stand back up to the starting position. Repeat with the other foot. The tendency here is to let your back leg take over as you fatigue, and do all the work. Don’t let that happen. The back leg should be basically “weightless” to ensure maximal muscle activation in the front working leg. 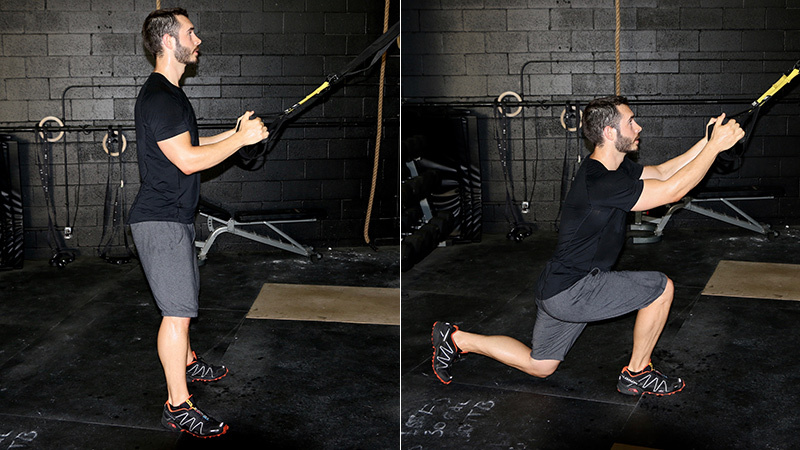 *Advanced trainees can progress to a “jump lunge.” All the same principles apply, with an explosive jump and soft landing. Facing the mount, start with your arms extended, chest up, abs braced, and feet out in front of you. The further in your feet go, the harder the movement. 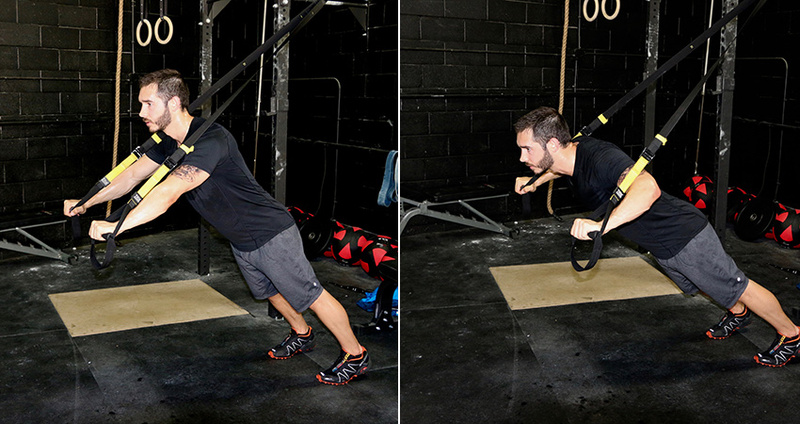 Start with a level of resistance that is manageable to complete all required repetitions with perfect form and tempo. Maintaining a “high elbow” position the entire movement, contract your biceps and bend your elbows like a hinge until you achieve a full muscle contraction. However, you should maintain tension in the Suspension Trainer at all times. If you stand up too far, or let your elbows sag down, you will lose tension in the working muscle. How many sets/reps would you recommend in order to make this a 30-40 minute workout?